Part educator, part detective, and part doctor, the Surface Diagnostic Toolkit guides you through a set of software repairs and hardware diagnostics to quickly and efficiently uncover and resolve issues you are experiencing on your device. Use this app to lookup information about your device, repair common software issues, and validate your Surface hardware. 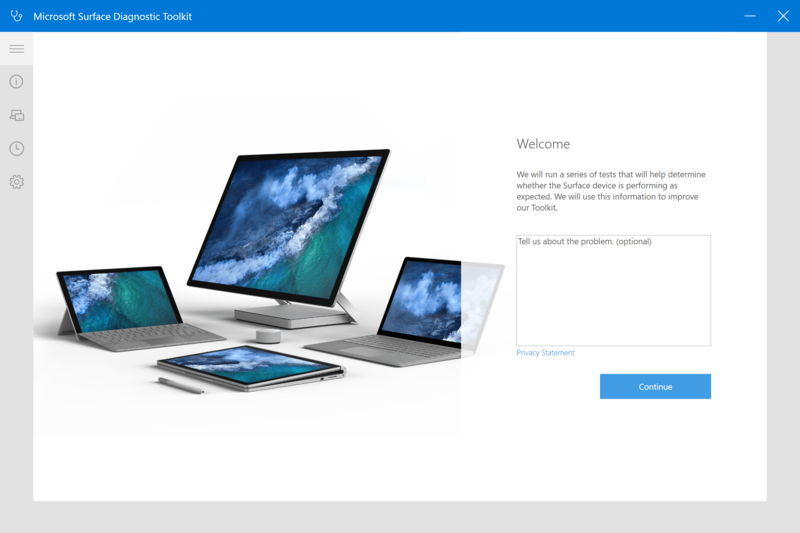 The Surface Diagnostic Toolkit is the best place to start troubleshooting, and will guide you to the best support avenue for the quickest resolution, so you can get back to turning ideas into actions and accomplishing more with your Surface. When you first run the Surface Diagnostic Toolkit, it will run a series of tests on the device to check it is operating correctly. These can take some time, so it’s best to make sure your Surface is plugged in to mains electricity during this time. After these complete, if you suspect that there may be a fault or problem, you can run the app to diagnose, and offer solutions for any problems it finds.